Holiday.gr - Megalochori, a trip to a myth! Megalochori is 5 km southeastern of the capital. It is the first village you will see as you drive from the port of Athinios on your way to Fira. It is a very beautiful village that combines in a unique way the traditional architecture of cyclades with the nobility of the neoclassic residences. Here you can visit the Boutari wine distillery. You can take a tour around it and taste the marvellous varieties of wine. 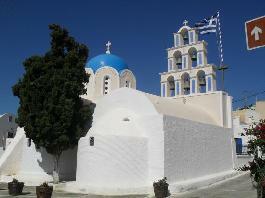 Don’t forget to visit the church of the Virgin Mary where you will see the famous Kalentario with its miniature icons. There are a lot of hotels and rooms to let in Megalochori. Been to Megalochori ? Share your experiences!